Hello stamping friend! I have a couple of reminders for you – because I hate the thought of you missing out on something special! Today is the LAST DAY to get the select stamp sets on SALE at 15% OFF! 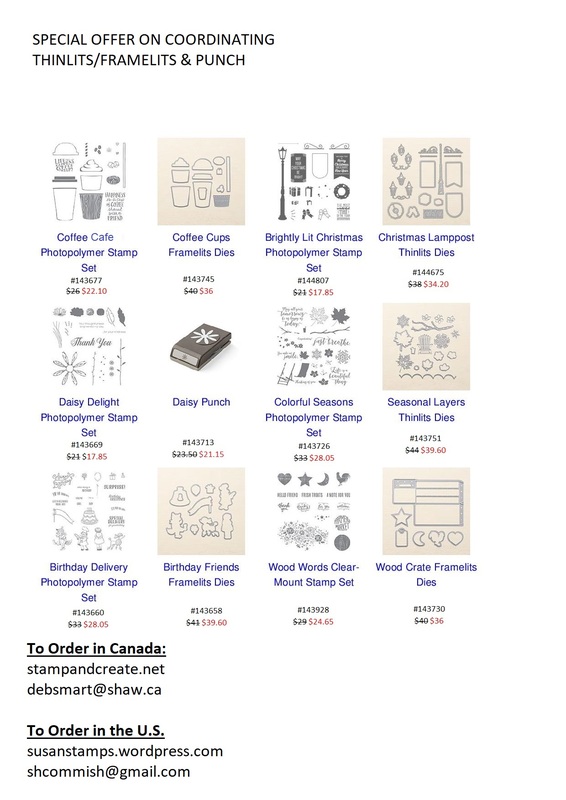 Not only can you get Stampin’ Up!’s special 15% off these stamp sets, but you can get MY SPECIAL OFFER of 10% OFF the coordinating Framelits/Thinlits! But you have to ORDER BY 10pm PST – or you’ll be too late! Either contact me directly at debsmart@shaw.ca for me to place your order, or CLICK THE BUTTON BELOW to order online immediately! If you are reading this, and live in the U.S., you can order from my good friend and Stampin’ Up! demonstrator Susan Horr – and still get this great deal! Simply go to Susan’s site HERE, or email her at shcommish@gmail.com – but remember to do so before 10pm tonight MT! Today is also the LAST DAY TO JOIN for the SEASON OF STYLE PAPER PUMPKIN KITS! From cards and tags to treats and gift packaging, there are many ways to add handmade charm to the holidays—but time can be in short supply. If you sometimes get caught up in the busyness of the season and need quick holiday projects, having the Season of Style kits on hand will make your life easier! To give you more of what you love, during October and November we’re offering two straight months of perfectly coordinated Christmas cardmaking and gifting projects. Having two coordinating kits means that 1) you will have everything you need to complete unique holiday cards and gifts, 2) you will have more creative options, and 3) you can get that handmade holiday touch without the fuss. These two kits – one will ship around Oct. 15th, the 2nd ships around Nov. 15th – coordinate with each other, but they can also ‘stand alone’. Which means that you don’t HAVE to have one, to get the other – but you’ll probably want both! 🙂 I’m so excited – I can’t wait to get mine! I’m guessing that the packaging colours may be a hint as to what’s inside – what do you think? To make sure you get the 1st kit – CLICK THE LINK BELOW to enter your information. If you’re already a subscriber, or a previous subscriber, your info will be on file; you’ll just have to activate it again, or make sure your quantity of kits is at least ‘1’ . If you’re a new subscriber, you just need to enter your shipping, email, and payment information.